Since today is all about bad faith arguments, I’m going to state something that seems pretty clear once you look over all the available facts from this now-deleted video: Fox News hates prayer. 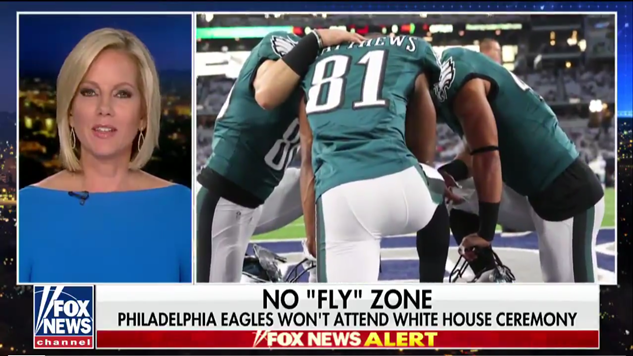 The clip was roughly 30 seconds long, and while one of the blonde Fox News ladies spoke about Trump disinviting the Eagles from the White House, it showed her side by side with shots of Eagles players praying. 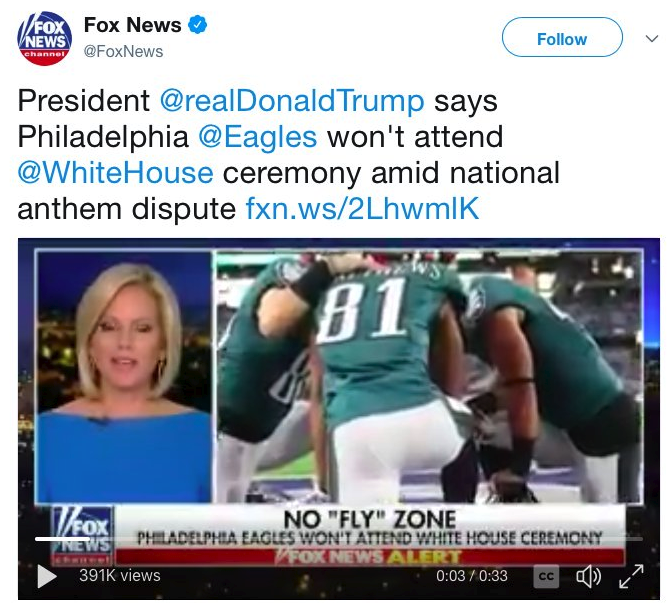 No Philadelphia Eagles players knelt in protest this year, which means that that Fox News splayed images of (mostly black) men deep in prayer across the screen in an attempt to depict them protesting during the anthem. One can only conclude from this that Fox News either sees prayer and protest as one and the same, or they believe that prayer is bad. I could do journalism here and talk about how Fox News is a propaganda channel filled to the brim with soulless hacks whose only joy in life comes from destroying the fabric of our democracy—all in subservience to a president who espouses the same kind of racism they have been preaching for years—but I’d rather stoop to Fox News’ journalistic level for this one and make a bad faith argument: they clearly hate prayer. If they sincerely believed they needed to correct this obvious “error,” they’d make an on-air correction (none has been made as of this writing). That statement was designed to placate the internet furor among those of us who still believe in journalism. Fox News knows what they’re doing here. They want to whip up racist hysteria among their geriatric audience while pretending to the rest of us sentient adults that they’re still a news organization. I’ll update my bad faith analysis when Fox News makes an on-air correction of their fraudulent “story,” so I wouldn’t hold my breath on this space changing anytime soon. UPDATE: For once, my cynicism around Fox News was unfounded. Within minutes of this post going up, I received an e-mail from a Fox News PR flack telling me they would “address” the story later that night. The point above still holds: Fox News has been covering NFL protests like it’s a war, and for them to assert that they mistakenly thought that players who were praying were actually protesting means that they’re either complete and total idiots who have absolutely no knowledge of the topic they spend days on end covering, or they’re liars. Regardless, an on-air apology was required, and they met it. Here’s Fox News essentially saying: you caught us, we’re sorry.